I’ve said it before and I’ll say it again – one of the things I love the most about food blogging is all of the great friendships I have made. 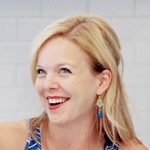 I have met a lot of really wonderful people through the foodie community, and this is proof. A month or so ago my friend Courtney approached me about the possibility of throwing me a virtual baby shower. How sweet is that? I was thrilled about the idea, so she took charge and rounded up my food blogging girlfriends. Everyone contributed a different dish for the baby shower – some sweet, some savory, and a mocktail as well! I feel blessed to have so many wonderful friends willing to take the time to participate, and I am blown away by what a fantastic job they all did! Delicious food and truly beautiful presentations. I have included a photo and brief description of each dish, but please visit the blogs of the ladies to get more details and the full recipes for all these amazing creations. Ashley of Delish made this lovely mock-champagne punch with ginger ale, pineapple juice and white grapefruit juice. I’m definitely a cocktail girl and I have been missing them the last month or two so this is a perfect way to feel like I get to enjoy a celebratory drink with the rest of the girls. 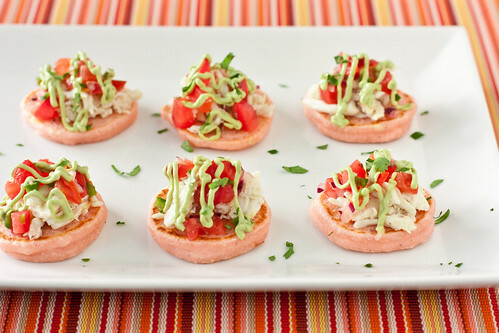 Shawnda of Confections of a Foodie Bride made these gorgeous pink corn blinis with crab and avocado crema. This is right up my alley. I’ve never had blinis before but I can tell that this combo would be fantastic. They look so fresh and light. I will definitely be trying these in my own kitchen! 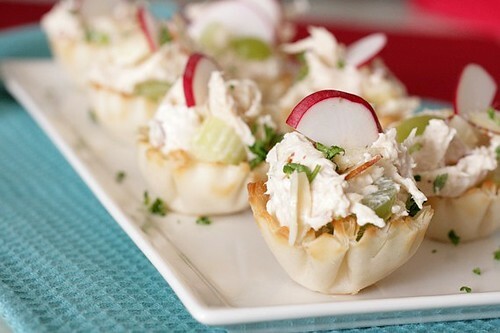 Amy of Sing for Your Supper made these adorable little chicken salad bites. Chicken salad seems to be the quintessential bridal or baby shower food. I don’t know why. Probably because it is delicious! I love the presentation in the little phyllo cups so that guests can enjoy a bite or two without committing to a full sandwich. The radish garnish is beautiful as well. Elly of Elly Says Opa! made these stuffed mushrooms as her contribution. Her version includes pancetta, goat cheese and cream cheese – yum, yum, and yum. 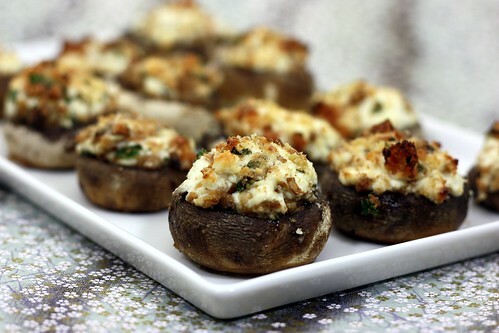 In my opinion, and as has been proven time and time again at my parties and get togethers, not many appetizers are as addictive as stuffed mushrooms. They are nearly always the first thing to disappear and it seems you just can’t make enough. Great choice, Elly! Nikki of Pennies on a Platter made these baby hummus sandwiches. I suppose if there were any food more typical of showers than chicken salad, it would be finger sandwiches. Who can resist such cute, dainty little bites? I love that these are hummus and veggie sandwiches rather than something more standard like deli meat – plus, pregnant women shouldn’t be eating deli meat anyway! I tend to eat hummus as a dip but I have just recently discovered the wonders of hummus and veggie sandwiches, so I am thrilled to see them here. 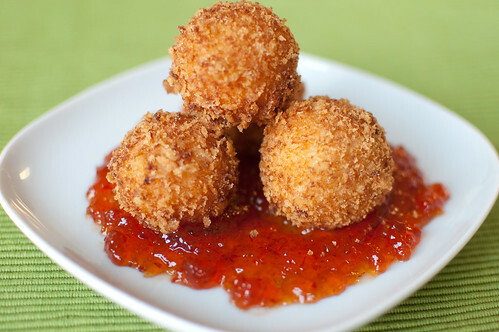 Josie of Pink Parsley Catering made these pimiento cheese fritters with sweet-spicy red pepper jelly. I’ve never tried pimiento cheese before, but according to Josie it is a must-serve food for showers in the South. I know I wouldn’t be able to resist fried cheese with a kick to it, and the pepper jelly for dipping is a perfect accompaniment. I can’t wait to try these in my own kitchen! Tara of Smells Like Home knows the way to this pregnant woman’s heart. 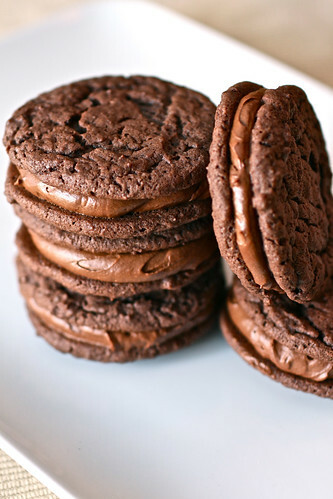 It is through my stomach, by way of chocolate – specifically chocolate malt sandwich cookies. I’ve mentioned many times my love of chocolate cookies, so taking two chocolate cookies and sandwiching them with chocolatey filling? Yeah, I’m all over it. 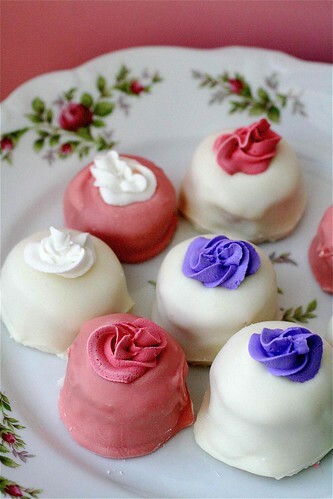 Shanon of The Curvy Carrot made these dainty little pink velvet cake truffles. Shanon is one of my best friends in real life, as well as a talented blogger herself. 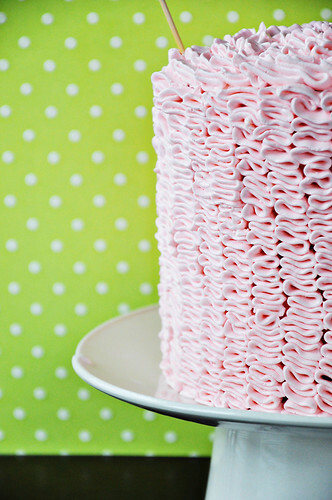 Since she knows me better than almost anyone, she knows red velvet is my favorite flavor of cake. With that in mind, she made this pink velvet spin that is perfect for a baby girl shower. Since we are friends and coworkers, I did have the opportunity to try these and I can tell you, they are fantastic. Every bit as delicious as they look. 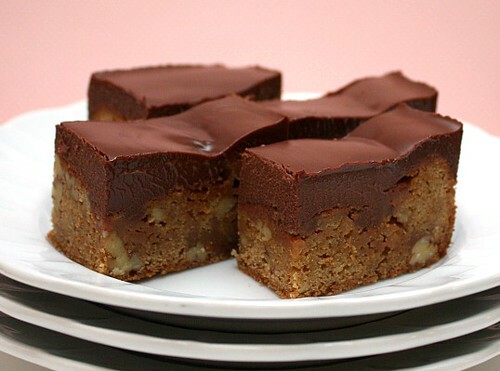 Kelsey of Apple a Day made butterscotch blondies with chocolate ganache. This girl knows me well, so she combined two of my favorite things in one dessert – butterscotch and chocolate. But not just chocolate – ganache, my favorite form of chocolate. These little bars would be sure to disappear in no time with such an irresistible combination of flavors. Lauren of Lauren’s Kitchen made this unbelievable brownie cheesecake trifle. Brownies, cheesecake spread, strawberries and Oreos? Holy yum. I am so glad I do not have gestational diabetes because I’m really going to have to try this, stat. Baby Girl and I say THANK YOU, THANK YOU, THANK YOU! I feel extremely lucky to have such gracious and talented friends who are eager to welcome this little one!